His memory is all I have left to love. World War I saw many firsts. The first aircraft in combat, the first tanks in combat, the first use of chemical warfare, the first use of a flamethrower in combat… The tactics of the time, however, were far behind the technology. On 30 July 1915 the Germans introduced the flame-thrower at Hooge through the “Totenkopfpioniere” or troops of the German Guard Reserve Pioneer Regiment. By the end of 1916 this regiment had 3,000 men and a total of some 600 flame-throwers. During the entire war, 653 attacks, most of them devastating, were carried out using flame-throwers. The warfare gasses of the First World War were derived from chemicals used in the textile industry. 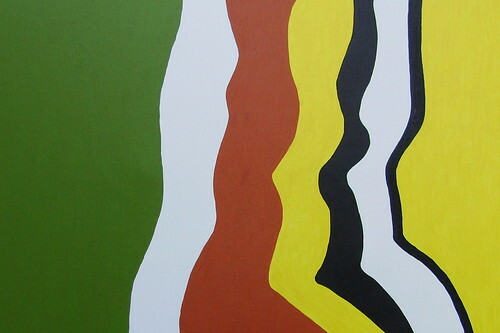 Chlorine and phosgene are used for making dyes, in which Germany was the market leader. The many accidents in the chemical industry gave German scientists the idea of further modifying the gasses produced and giving them a military application. From August 1914, the Germans tried filling shells with gas. Their early attempts were not successful and instead they decided to fill steel cylinders with chlorine. 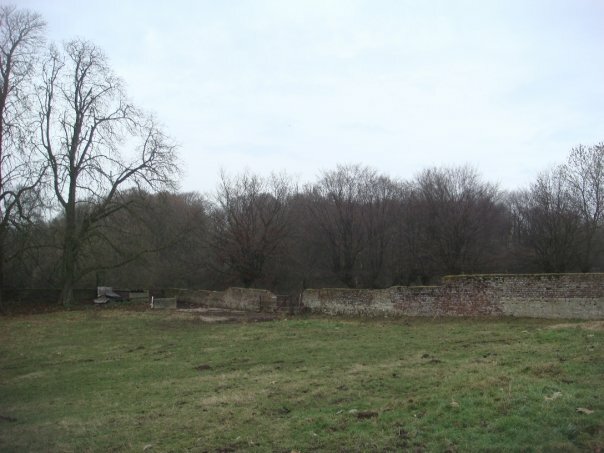 In the spring of 1915 the Germans in Geluveld planned a large-scale gas attack on Hill 60. 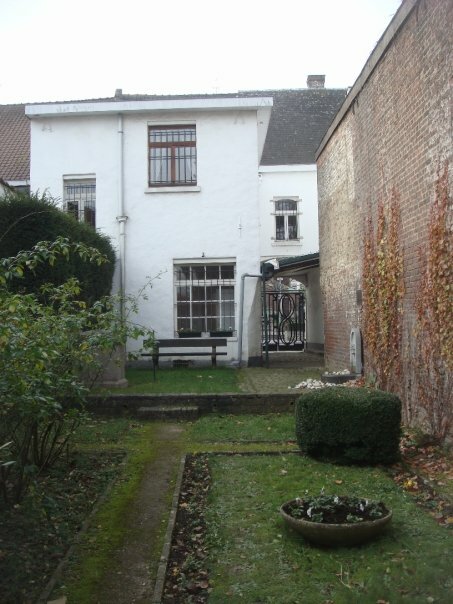 But, because the desired north-easterly wind failed to blow, the attack was shifted to the front between Langemark and Steenstrate. The Allies ignored a whole series of warnings that a gas attack was imminent. Even deserter August Jager, who handed them the complete German plan, was not believed. 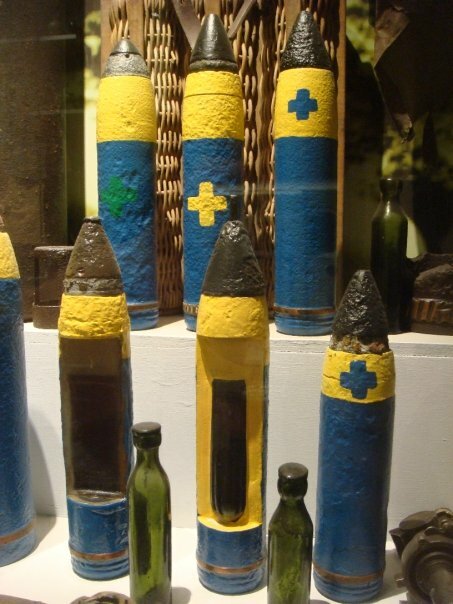 On 22 April 1915 the Germans released more than 5,000 cylinders of chlorine gas. Huge gaps appeared in the Allied lines as a result but the Germans underestimated the effect of the new weapon, and they didn’t have enough reserve troops ready to exploit their success. Gradually the Germans developed odorless and colorless gasses whose effects are not immediately felt. They worked with about twenty different types of gas, including phosgene, a potent chemical whose effects are only noticed after a couple of hours and which is ten times more deadly than chlorine gas. 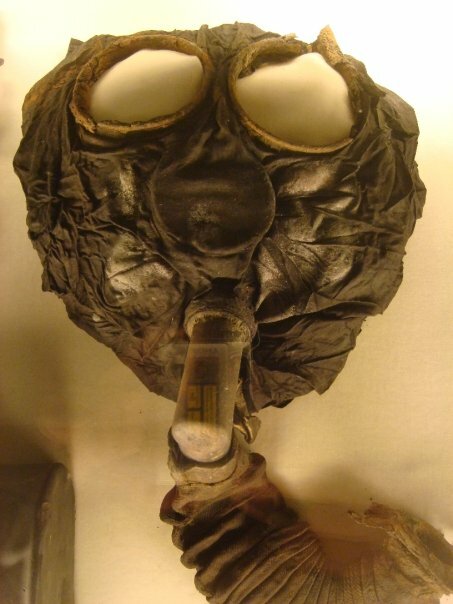 On 12 July 1917 the Germans introduced mustard gas – also known as Yperite – on the Ypres front. This is an oily liquid which is spread in the air with shells. It’s absorbed by the skin, which hours later begins to itch and form blisters that soon burst and fester, with terrible mutilations as a result. Each of the warring parties employed gas on a massive scale: the Germans used 52,000 tons, the French 26,000 tons and the British 14,000 tons. Even so, less than 1% of the total number of victims of the war succumbed to the effects of gas. 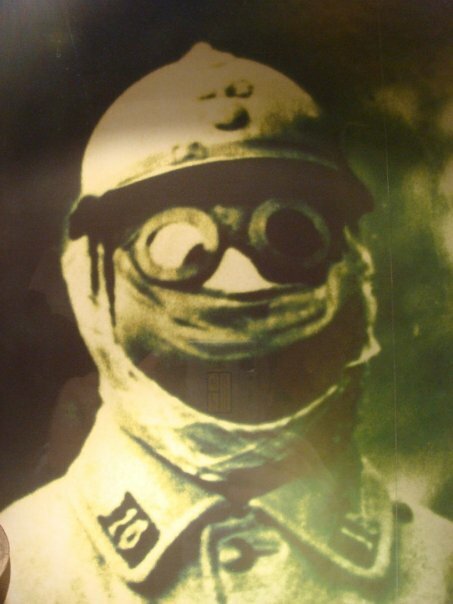 This is because gas masks were quickly developed. Nonetheless, the Germans and the Allies continued to use gas so as to force the enemy regularly to don their masks – this had a very demoralizing effect. Thus – leaving aside the terrible mutilations caused by mustard gas (Yperite) – gas is used mainly as a psychological weapon. These are the artillery shells with which gas attacks were launched. The vials of toxins were placed inside the shells. 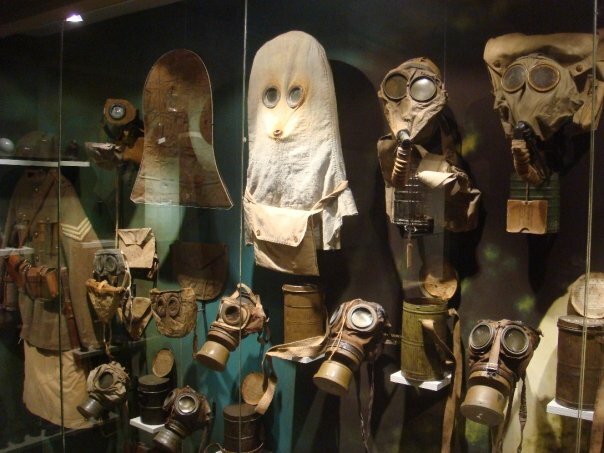 An assortment of gas masks and chemical warfare suits in a museum we visited. We started by visiting the home (now a museum) where the Duke of Wellington was billeted. 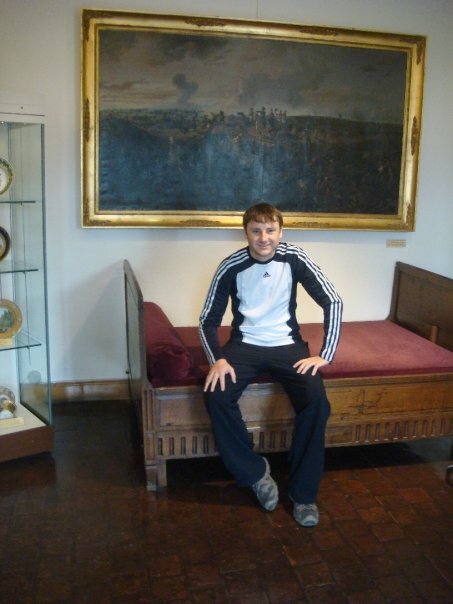 And, of course, we all had to take turns having our pictures taken on the Duke of Wellington’s bed even though we were not supposed to. Then it was on to the famous battlefield itself. This is the monument marking the spot. 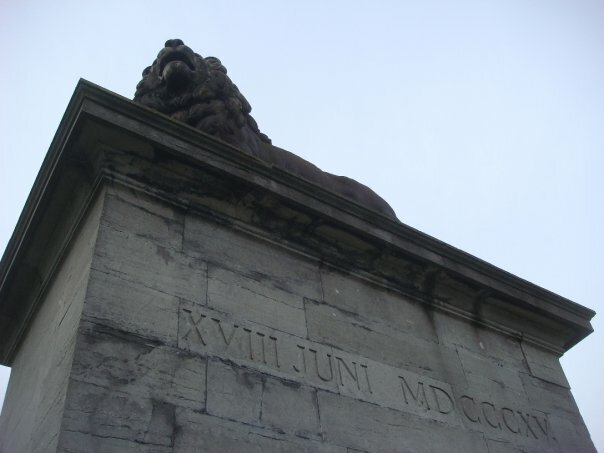 And this is the lion positioned at the top. 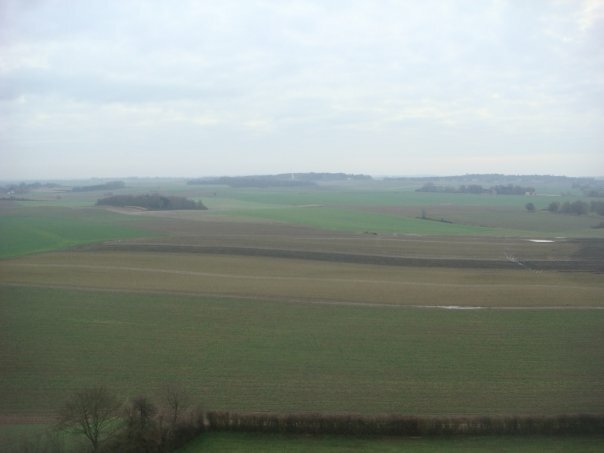 And this is the view from the top of the monument out across the legendary battlefield. 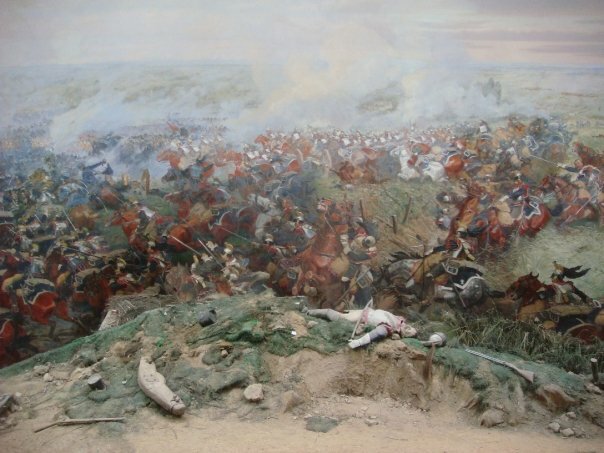 A panorama at the base of the monument features a 360 degree view of the battlefield (The “real” parts of the set are all in life-size and one looks down on the battle from above). 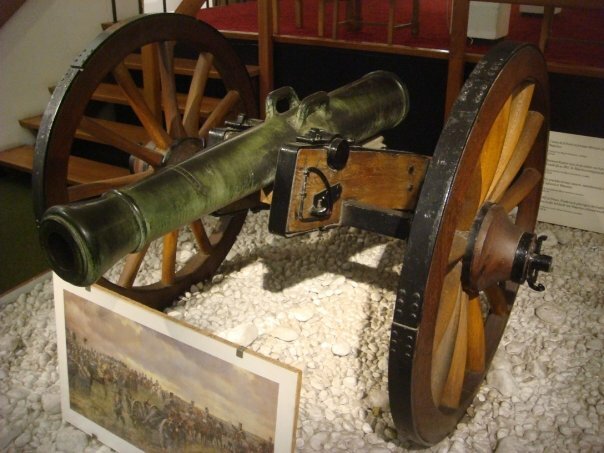 With intense sound effects – screams of horses and men, booming cannon fire, rifle fire – it is deafening inside and it makes you feel as if you were really there. It gave me an adrenalin rush. Here are two pictures I took inside, but they don’t do it justice at all. 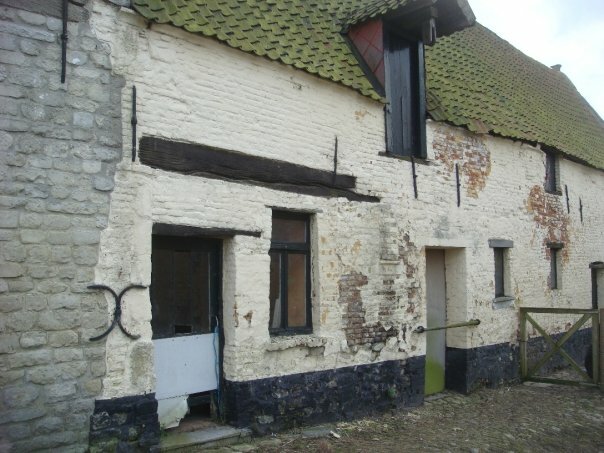 On the far side of the Waterloo battlefield is Hougoumont Farm (also known as the Chateau of Hougoumont), where the battle of Waterloo really started – and where many say the battle of Waterloo was actually won. 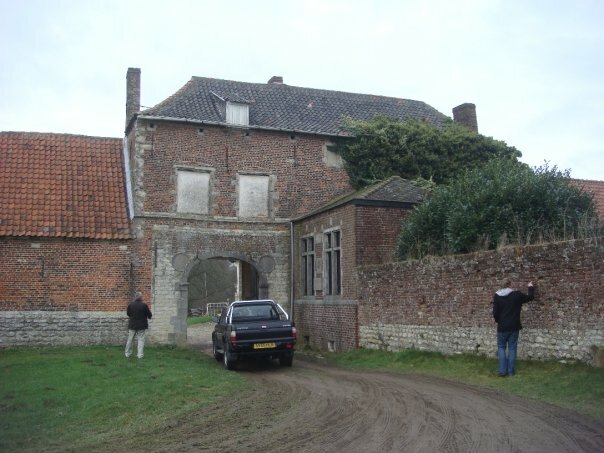 Wellington himself declared afterwards that “the success of the battle turned upon the closing of the gates at Hougoumont”. These dogs really wanted a piece of me. 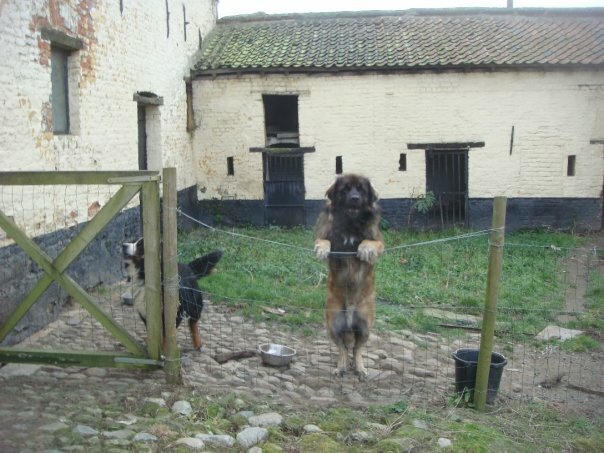 The dark, hairy one was snarling and throwing itself at the fence in an effort to get to me. The fence was poorly constructed and was shaking violently when the dog hurled himself at it. I wonder if the Coldstream Guards would have fared as well against these dogs as they did against the French? Nigel and Andy inspecting the musket ball and shrapnel damage to the farm. Andy’s mighty Trojan 4WD is in the middle. 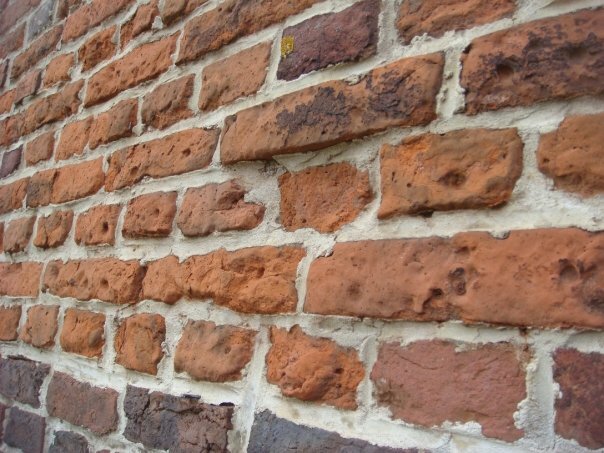 Those indentations in the bricks are not natural. 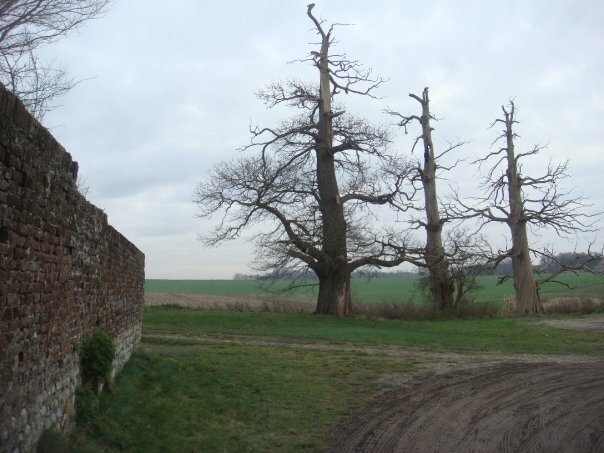 These walls were absolutely peppered with shrapnel and musket balls. Newfoundland, not a part of Canada during WWI, received its own war monuments. 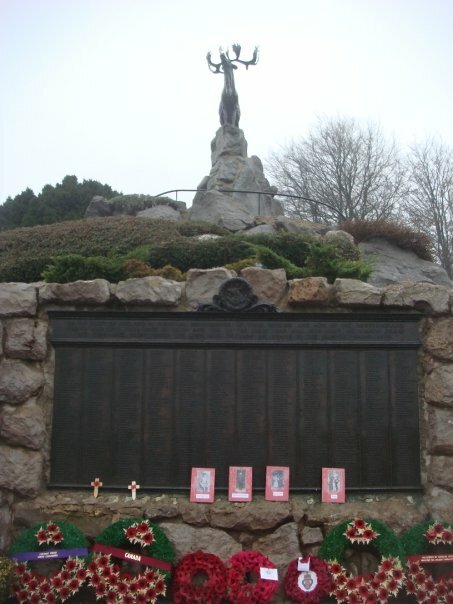 The exploits of the Royal Newfoundland Regiment earned the small British colony 5 overseas memorials: the Beaumont Hamel Memorial probably being the most famous. 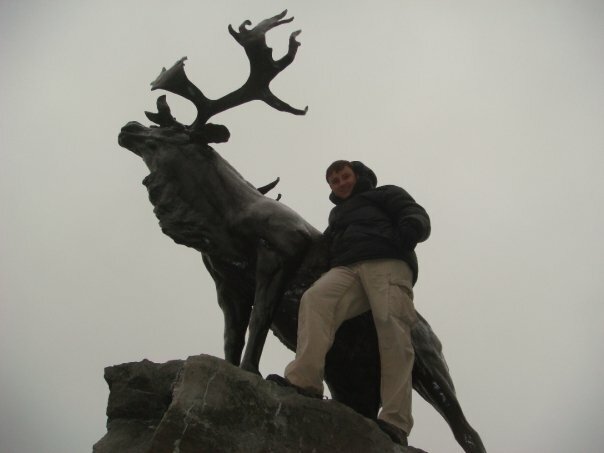 Each of these structures consists of a cairn of Newfoundland granite in the form of a natural outcrop of land supporting a bronze caribou, the emblem of the Royal Newfoundland Regiment. The mounds are surrounded by native Newfoundland plants. At Beaumont Hamel on 1 July 1916, the opening day of the Battle of the Somme, the Newfoundland Regiment was absolutely obliterated by enemy fire as it advanced across the exposed slopes. The Beaumont Hamel Memorial. This land is now owned by Canada. Of course, I had to climb to the top. 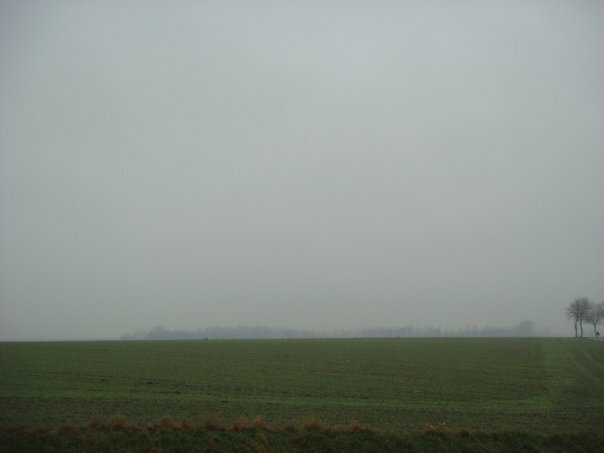 This is the view of the battlefield from the top. 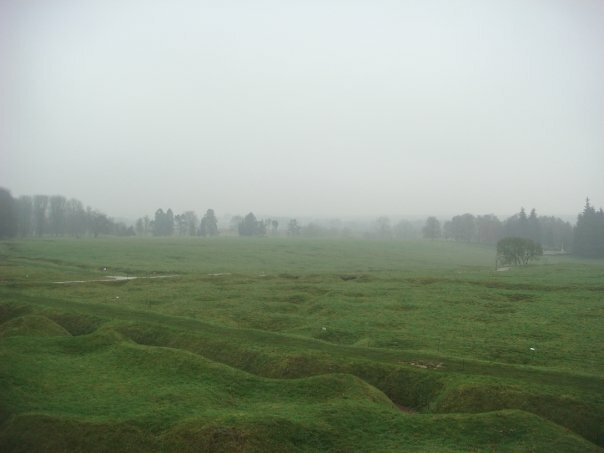 You can still clearly see the crater holes and outlines of the trenches. That’s 60,000 in one day! 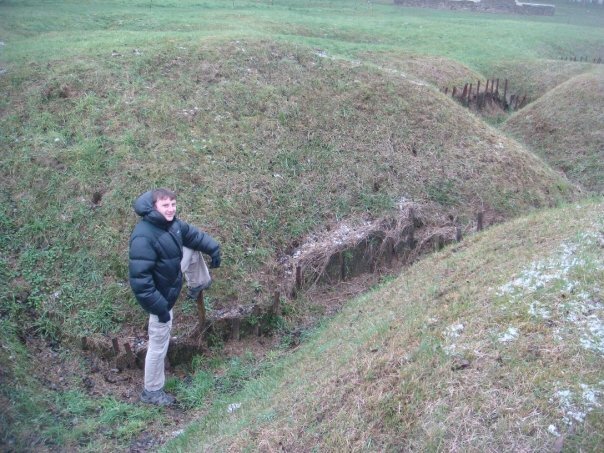 We went down onto the battlefield and started exploring the trenches. 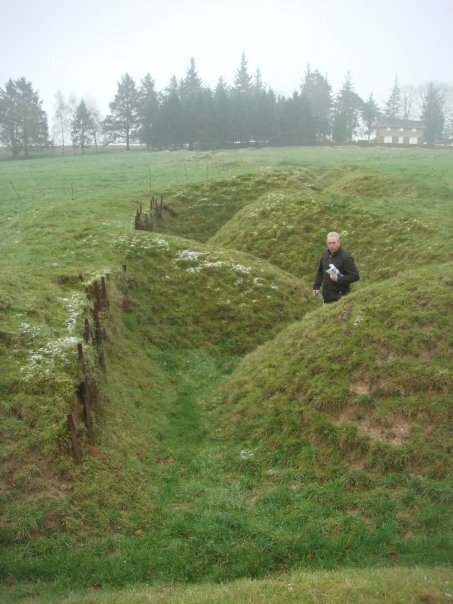 Here’s Nigel looking for a good picture and providing some scale to the size of the trenches. This is the Danger Tree. 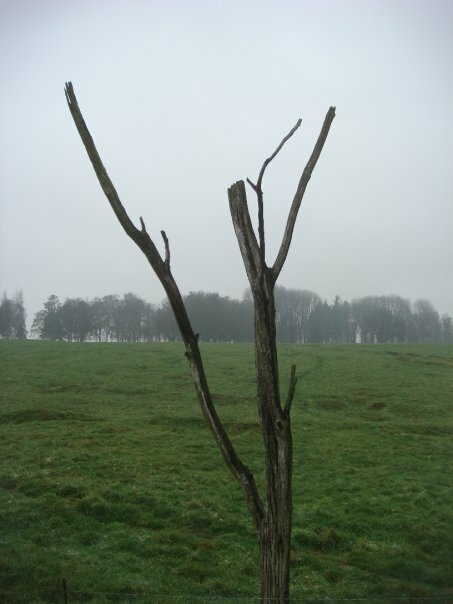 It somehow stayed upright in the middle of No Man’s Land, despite the utter destruction around it. However, it served as an excellent reference point for artillery barrages as well as for snipers and machine-gunners. So, it would not have been a good place to visit during the First World War. 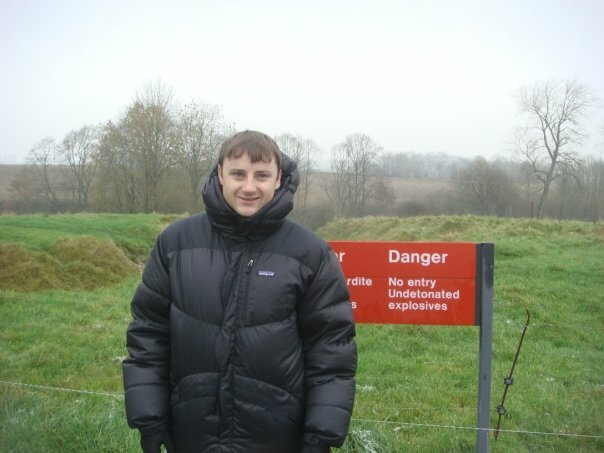 So, naturally, we did proceed and went exploring down in the trenches. Nigel Green and Andrew Drury exiting the battlefield. Next up: Agincourt (or Azincourt if you are French). It was eleven in the morning on the 25th of October 1415. Henry V and his troops were retreating to Calais to embark for England when they were cut off by French forces which outnumbered his by an amount most historians agree was 4 to 1. The English coming off of an 18 day march across 250 miles of hostile territory under constant harassment were suffering from dysentery and exhaustion, and were further hampered by inclement weather. Lightly clad, the English archers were more supple in their line of command. Using time well, they dug stakes into the ground to give protection against cavalry charges and to allow them to shoot arrows over the top. The bugles and trumpets of the French then began their loud calls. Each group was under its own banner, its leader at its head. The well equipped French first succeeded in pushing back the English, but progress was difficult because the ground, a recently plowed field, was muddy from recent rainfall. 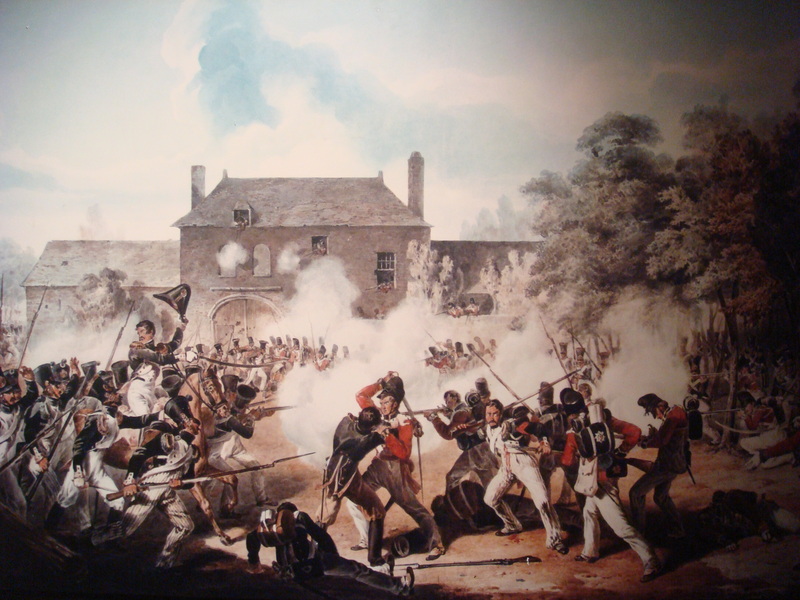 The shooting of the English archers did nothing to reduce the disarray among the French ranks. At the same time, the French support troops were becoming less orderly, continually pushed forward by those behind them. The French soldiers were so squashed together that they could barely lift their arms to fight. 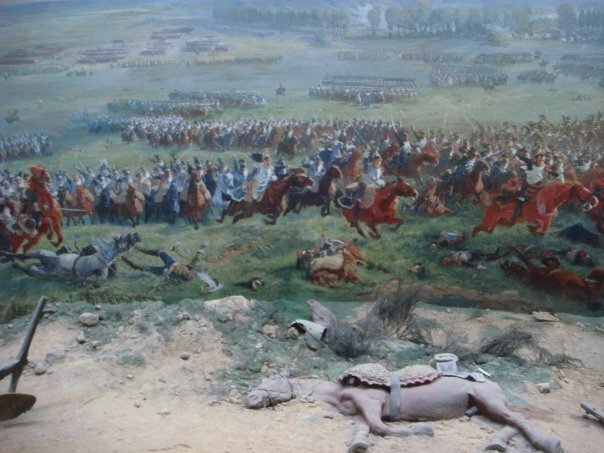 Additionally, the arrows of the English archers badly frightened the horses, the cavalry having been strategically placed on both flanks. The panic amongst the horses did not help morale amongst the soldiers. The French troops, marching through the middle of the mud where they sank up to their knees, were already overcome with fatigue even before they advanced against the enemy. The deep, soft mud particularly favored the English force because, once knocked to the ground, the heavily armored French knights struggled to get back up to fight and several knights, encumbered by their armor, actually drowned in the mud. Taking advantage of the situation, the English left their refuge of stakes, taking their swords, axes and other arms and hurled themselves on the French line. This resulted in a tremendous slaughter of the throng, the French being too restricted to reply or defend themselves. Many French soldiers that had fallen to the ground were unable to get up at all and could only thrash helplessly on the ground as the English ruthlessly and efficiently went about thrusting a blade through the slots in the French armor. The end result was a tremendous victory for the English and a humiliating loss for the French. Almost 600 years later, this battle still resonates strongly for both the English and the French. 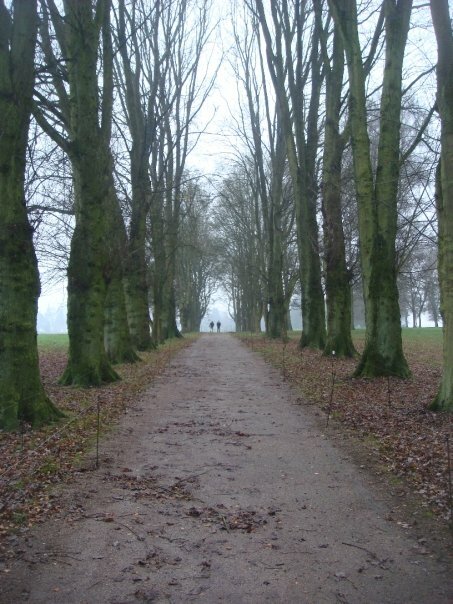 The battlefield is pictured below. 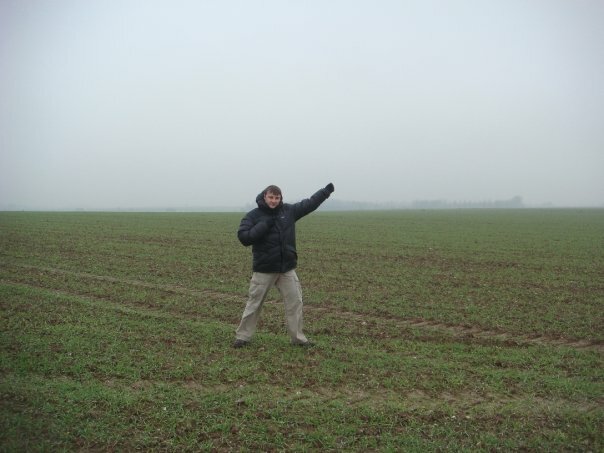 I could better sympathize with the French predicament when we ventured out into the fields. We were under very similar circumstances, walking through a recently plowed field after heavy rains, and almost immediately we started sinking down into the mud and my shoes are still caked with it. My tribute to the English archers. Recent analysis of the skeletons of English archers from this time reveals that their back and arm muscles were so strong that it actually left them deformed. I’m not exactly in that league. 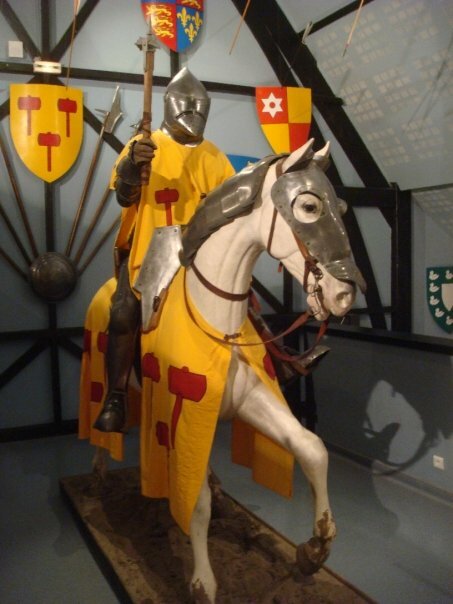 By the way, despite being in France, the museums around Agincourt are remarkably unbiased – unlike those around Waterloo which leave you with the impression that Napoleon won the battle (and I’m saying this even as a fan of Napoleon). 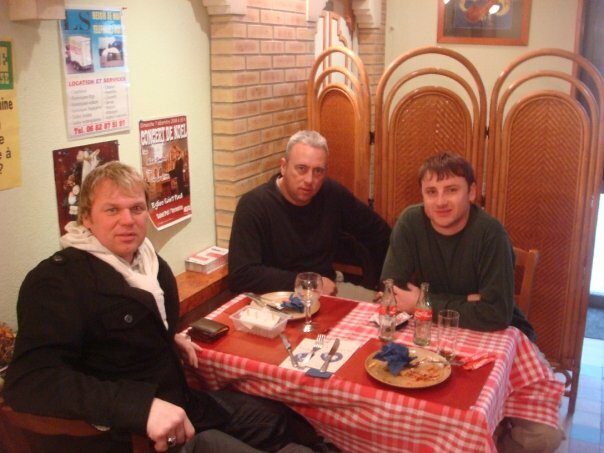 After the day’s death and destruction, it was time for a pub… The lads at the end of another successful trip: Andrew Drury, Justin Ames and Nigel Green. 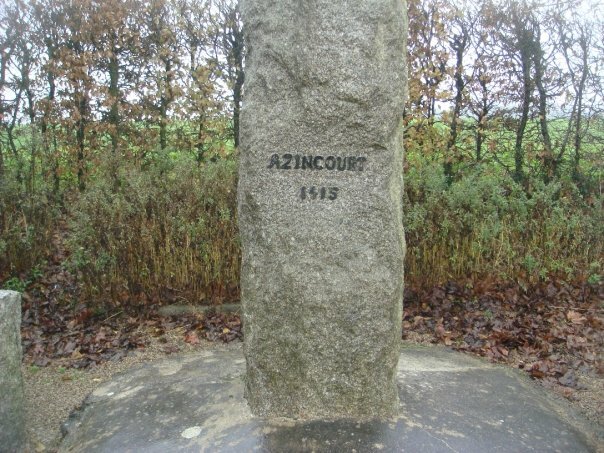 Tags: Agincourt, Azincourt, Beaumont Hamel Memorial, Chateau of Hougoumont, Hougoumont Farm, Justin Ames, Waterloo. Bookmark the permalink. Beautiful pictures and quite daring shots! I can only say I’ve got to visit some of these battlefields myself. They’re worth checking out, Andrew. 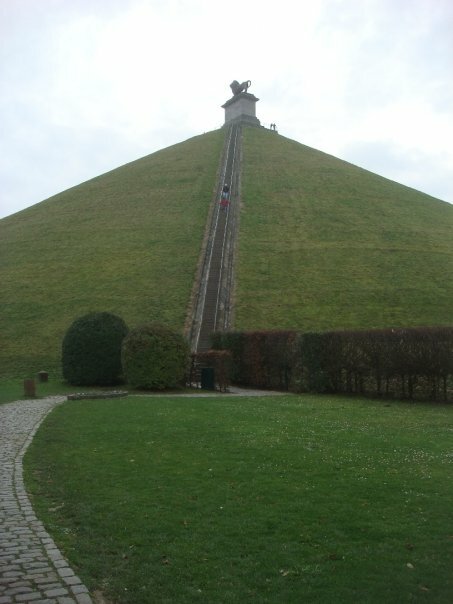 It is amazing how many of the battlefields of World War I are still intact and visible. And even those such as Agincourt and Waterloo (while less visible evidence of combat) are interesting and worthwhile.